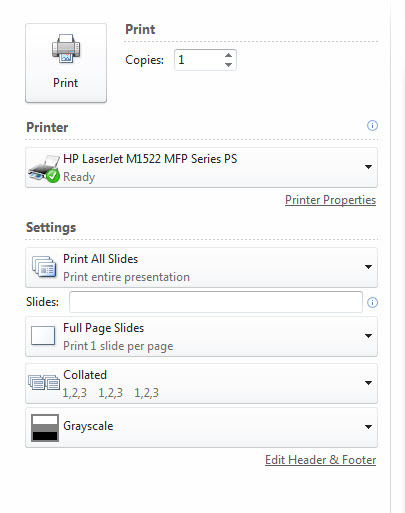 If you are printing from a campus computer in a lab or in the Library, always make sure you wait for your printout to come out. If you leave, we will place your printout in the recycling and it will be disposed of. Then you will be printing it again. Please do not print full Power Point slides in the computer labs. 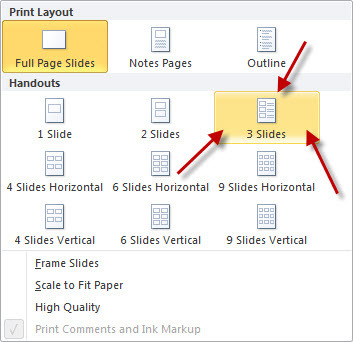 Use the instructions here to print handouts instead of full slides. Pay attention to the printing options. These are the Power Point default options. Change from printing slides to printing handouts. Select at least 2 but 3 is even better. Change from printing Grayscale to printing Pure Black and White. 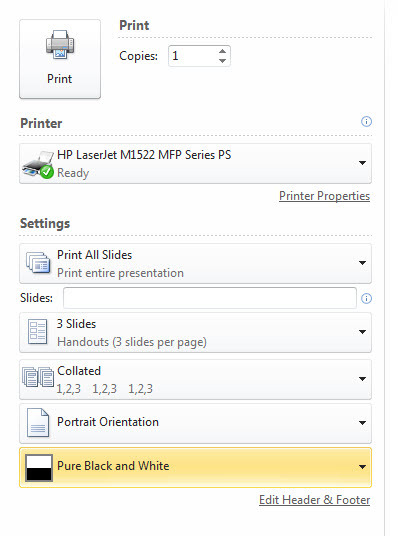 Your printing options should look like this BEFORE you hit the print button. As a reminder, you can save the Power Point file to your flash drive to take it with you.